I am trying to think through scoping these individually, and they are all quite ambitious. Ideally I want something with local multiplayer, because I think that'd be the most fun. Update: I've landed on mini golf! If I get it done with time to spare, I want to attempt a hockey game as well. Fun! So I am finished my game! Yay! I've posted the stuff over in the finished game thread. Now I want to have some fun with it. I'm actually going to play through for fun and find my absolute best scores. Then I am going to post a screenshot of my score card, and open a challenge for everyone to try to beat each other. Woo, fun! I can hit the ball and it moves, bounces, animates (rolls), and slows down based on friction. The hole will be adjustable based on the difficulty. So a really easy game means you can fire the ball at the hole at top speed and not quite hit it, but the ball will magnetically start rolling in. A hard game would require very soft touch on the final putt, and a very exact aim. Small progress update. Got multi-ball collision working, and fixed some bugs. 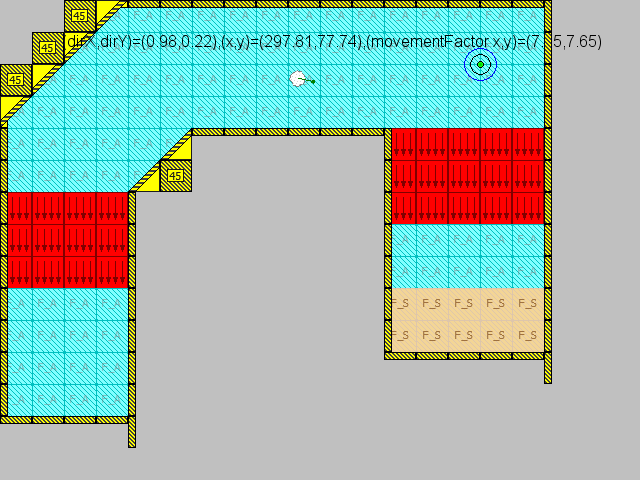 Also implemented arbitrary angled ramps which work very nicely. I am happy with the progress so far. I think I am going to retire for the evening. Got basics of players and gameplay in, but they are not working properly yet. Did some preliminary texture work, but it's still just placeholder more or less. This was causing such confounded rage just a moment ago..."WHY ARE RANDOM BALLS MOVING WHEN I PUUUUUUTT?!?!?! " Progress for the evening. 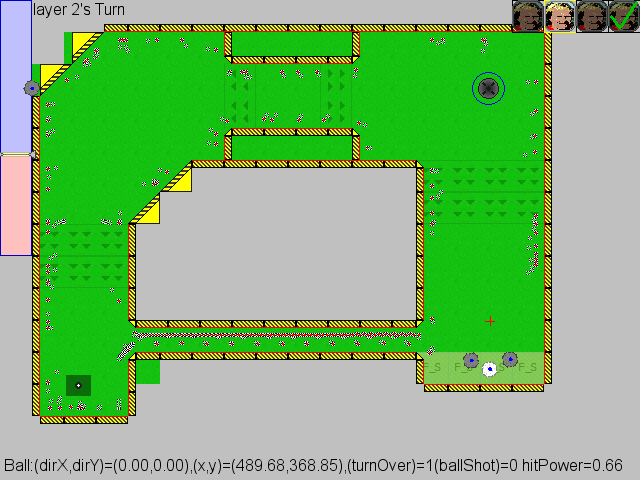 Player rotation and "hole done" works for each player and all players (to move to next hole). But I broke something in the "power meter" shooting mechanism that shoots all the balls. Need to re-factor that code. Small progress update: Collisions are behaving 99% better. 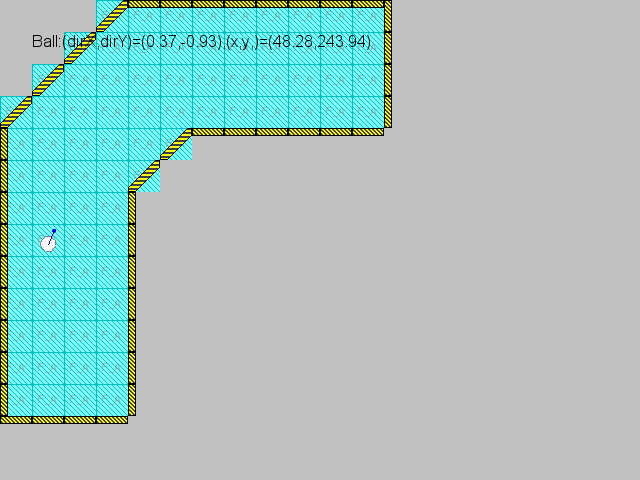 I improved this by doing 2 things: actually changing the angles for each wall (d'oh) and adding little 45 degree corner bits so that there were no seams present for orthogonal wall objects. I also got the tee working such that a shot that lands back on the tee requires a mulligan or scratch shot be taken. Time to play with some more obstacles, ramps, and other real world fun mini golf stuff. P.S. 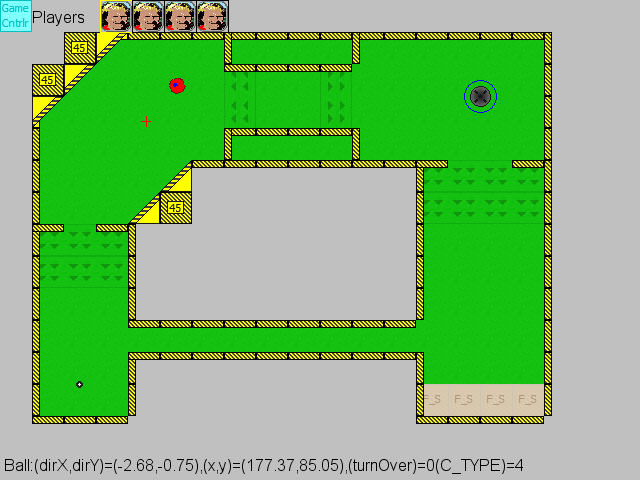 the tiny things near the walls were just little flashing debug objects I made. They'll be gone soon. Some more progress! Woohoo! Got regular and moving obstacles working. 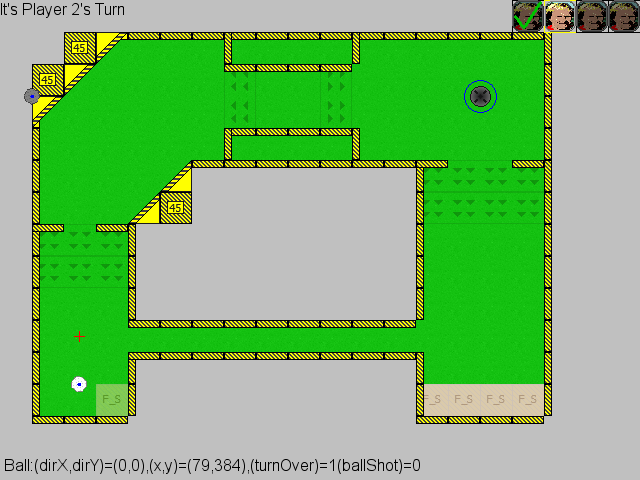 Also added those cool "teleport cups" (where the ball goes in the cup, goes down a pipe then comes out somewhere else on the hole). I've also been playing with the physics and adjusting the friction value of the "grass" and added some absorbing wall factors so that it's more like a golf ball and less like a hockey puck. Next, I want to add more hazards like water. 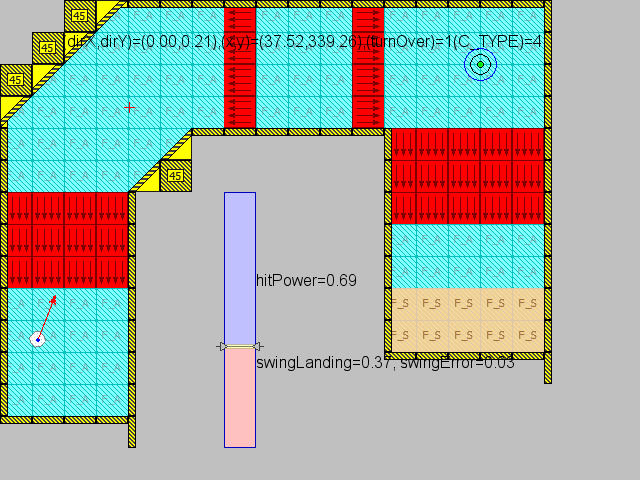 And maybe add ramps and stuff where you can jump/gap hazards if you shoot hard enough. It's actually getting pretty fun, because all the little systems are interacting. 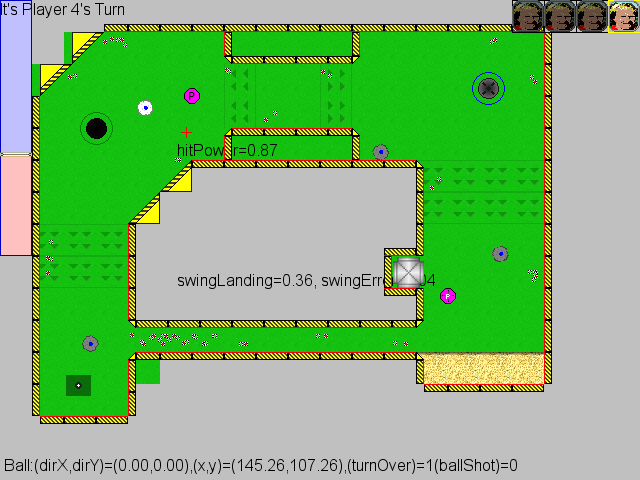 For example, player 3 hit player 1's ball and knocked it down the teleport pipe where it was hit by a moving obstacle and knocked into a sand trap. Neat! Looks like you're doing heaps of work, can't wait to see how it finishes up. I was totally hooked up on golf games as a kid. Can't wait to play this game, looks like great fun. Now back to work! hehe. Will you add FXs and such, going for a cartoon way, or keep a more serious style ? Edit: And by that I mean semi-realistic looking balls, grass, etc. but with some juicy fun visual and audio effects. So serious looking, but not serious.